Micromax one of India's leading budget mobile manufacturer has paired up with Google to give the best budget Android phones. We got this information in June in the Google i/o, that Micromax along with Spice and Karbonn would be making these Android One Smartphones for the Indian market. How many of you know what Android One project means, that alright we will explain. The Android One project was started by Google to capture the developing market where budget phones take over so well then all the flagship phones, India is a market where the Smartphones market is started to grow in the last couple of years so Google saw its opportunity and is jumping straight in. The Android One Smartphones are the sort of like the Nexus phones, they will have good hardware specs and they will be getting the updates directly from Google like the Nexus devices. 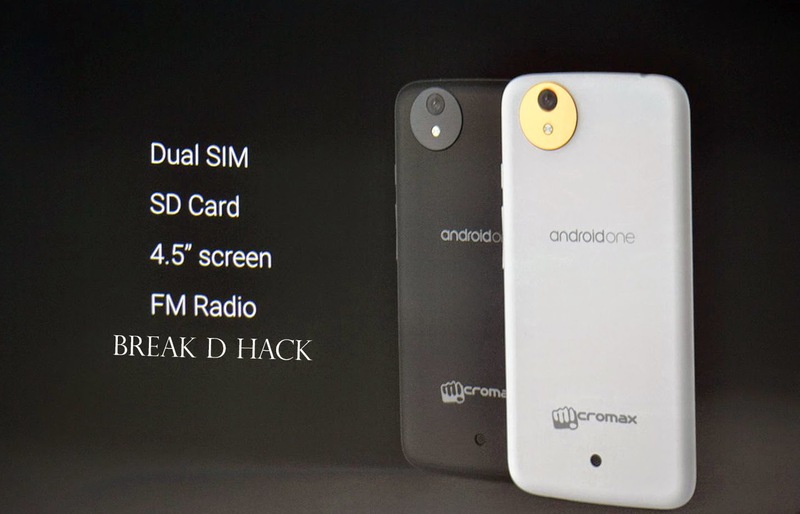 The Android One Smartphones releasing in India would have Dual SIM, FM Radio, SD card feature and a better processor. Micromax one of the Company in the Android One project is trying to be the first to release the first ever Android One Smartphone in the Indian market on 8th of September. It is rumored to be bought only from the E-commerce site Snapdeal exclusively, the phone is said to priced any where from Rs 6,000 to 7,000, but it would definitely be affordable. The Phone might have a 4.5 or 4.3 inch screen with 1GB of RAM 5MP camera and a Quad core processor. Micromax may be releasing the phone in an hurry because of the success of the Firefox OS phone by Intex in the past week. Micromax is trying to get the market by releasing soon, Google has announced a September 15th event to showcase its Android One devices, let all hope all these phones do well in our India Market, so that we get more good phones. This helps more consumers to have the latest phones in cheep cost and Huge companies like Sony, Samsung, HTC and LG would eventually start doing the same and we get benefited from that. So what do you thing is the Android One project good or bad, are you going to get one, please share your comments below. Micromax is just a stupid company, they offer nothing but scraps, I have micromax canvas doodle and within a year, I need to rush care center for 3 times. And still waiting for things to be fixed up. They sell thousands of phone with very little minor change. They are like indian version of Samsung. Switch back to NOKIA again after this horrible experience. Break D Hack © . All Rights Reserved.